but not this summer - been NE-N winds off the Pacific - Hot days - humid and as soon as its dark the cloud rolls in thick and low off the ocean. Even had fog in the middle of summer and 25c ! but having bought a CEM120 .. building an obs and added a second scope to pier 2 ... I feel like I am flipping the bird to the cloud gods! The last three nights here have been outstanding. The view of the Venus and Mercury conjunction was breathtaking. To end the streak, we are getting somewhere between 2 and 12 inches of snow overnight. For me its always cloudy but we are getting clear breaks every now and then thanks to the WIND. Regardless I still need to get adapters for my new FeatherTouch auto-focuser so I still have not taken a single shot. OK yes I admit I could go out right now and use my mask to manually focus but since my system is completely new I'm waiting till I can ring everything out all at once but alas once I get setup I'll be stuck smack dab in the middle of galaxy season with a EON130 NB setup. I just can't win with timing. that the park is closed Mon-Fri for "tree thinning" until MAY ! Arrgh.. At least we have the weekends. Clouds and cold here. Taking every opportunity I get and actually checking off a good number of Messier objects in spite of it all. Well tonight I am probably just wasting time taking data. My guess is that when I try and process what I am getting tonight, I will just end up junking it. But at least it feels like I am taking data!! so there is always that to keep you going. Self delusion is a wonderful thing! The forecast has a few hours of clear skies later this week. I can at least hope. I also spent some time - and money - on Amazon ordering some connectors, shrink wrap and a soldering station to use when I redo all my cabling for the umpteenth time. I have a new rigrunner/powerpole power system that I am going to put together as well as a new focus controller for both my APO and SCT coming. That will keep me busy during galaxy season since that is not that exciting to me. I love nebulas more. I also am trying to figure out a better place to move my rig in my back yard so that I get more time on Orion before hitting the tree of doom. I will need to figure out how to polar align without being able to see polaris. Should not be that hard to do with a semi permanent setup like I have. It would be a much bigger pain if I was setting up each night. Edited by cfosterstars, 06 March 2018 - 10:23 PM. I'm just west of you in Hunt, near Kerrville. I feel your pain! I really thought we'd get some clear skies from the front that just passed. NOPE! Kinda clear in the morn, then this high overcast that seems unbreakable. Ugh. Yea, just clouds... I would not mind as much if there was rain since we need that. But clouds with nothing to show for it is just frustrating. I took about 30 frames of blue filter to "finish" one of the panels of my B33/Flame mosaic, but I bet it will be sucky data and I will have to replace it. Tomorrow night is supposed to have 4-5 hours of clear skies. We shall see. NOT holding my breath. Yep, I get it. After getting maybe 2.5 images all last winter, I got motivated to move my scope to New Mexico. Now I definitely get more imaging done; though, it's not as much as I expected. Wind, seeing issues, and storms still hit New Mexico. At least it's much better than in central Oregon. Summer will be a different story when the monsoons hit. Anyway, I'm glad that I did it. Not only do I get more imaging done, but now I get some sleep! In my native language (exactly like a man and a woman), weather and astronomy have the ****/gender of a noun. Astronomy and the Weather are cooking admirers of astrophotography on a small flame. Edited by GA-HAMAL, 07 March 2018 - 04:23 AM. I've not had any good weather for weeks. The only time the sky was clear was at the time of full moon- which feels like a kick in the nuts. We must have upset the weather gods- I think its time for another sacrifice! 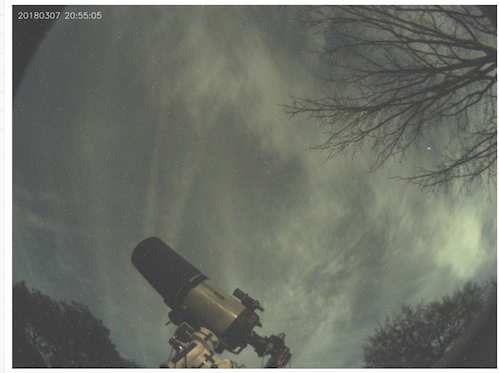 My last decent imaging session here in Driftwood, TX (SW of Austin) was in late November. There have been occasional nights when seeing was reasonable but not much in the way of sequential nights for completing a filter series. I used the down time to complete my observatory automation but I sure will be glad to see a change in the weather (if it ever occurs). My target list is getting longer and longer, there may not be enough dark time left this year to complete it . I sure hope it clears up in time for the Texas Star Party in May. Nothing unusual here. The weather is always terrible. I've gone 4 months easily without a clear night and longer without a clear moonless night. The Great Lakes are nothing but cloud factories. It is awful and the main reason i try to focus on circumpolar targets that are up all year. I wouldn't ever finish a target otherwise. Edited by karambit27, 07 March 2018 - 09:17 AM. From Clouds R Us eastern Texas. Only a month? You’re cute... I haven’t been able to image since LAST SEPTEMBER. And I’m in “sunny” SoCal... home of endless fires, skies full of contrails from thousands of aircraft, full spectrum LED streetlights and more pollution haze and high, thin clouds than I’ve seen in the last 10 years. We have also had four months of overcast skies here. As I suggested in another thread, it may be due to global warming. If so, expect more of it. Sorry to be so cheerful! When I get into long stretches of bad weather like now I find that my criteria become less and less stringent. Last night looked like it would be clear for about half the night, but the moon was still a bright, waning gibbous. In summer months I wouldn't even have bothered to start, but yesterday evening I went through the whole process with trepid anticipation. My last one night stand in February ended badly with clouds rolling in just as I got down to imaging. Luckily this time the forecast held, and I got lots of new, albeit mediocre images to play with, but I realize that it could be months again before another hole opens up in the sky. This is the life we have chosen for ourselves. In my areas worsening conditions lasts already for three years, periods of the cloudy sky lasting even 6 months non-stop are. Not necessarily global warming, can simply global climate change. Well it is clear for the moment and I am trying to get the remaining B and G data from my B33/Flame mosaic. The data I took last night was very marginal so I may have to retake it. Also the forecast for next week is not so sucky. However, I have fallen for that several times and then forecast changes back to sucky.